The winds have calmed, the sun is out, and some of our local species that we target in the Spring are making a great showing. I had a chance to see if the Pompano had changed their feeding habits from the early morning bite that they are known for in January, February, and early March to the late afternoon bite that is characteristic from late March into early May. They did not disappoint today as I was able to put a limit catch together in less than an hour. The bite turned on at 5:30 pm today, and at 6:20 pm I was packing up the gear and heading home with my six pompano. Hobe Sound was the beach I fished and I caught them on Sand Flea fishbites, clam strips, and calico crab pieces. The nice thing about our springtime Pompano is they are all a nice size - from 12 inches to 17 inches. I also managed to catch some whiting, blue runners, and bluefish. The folks at Hobe Sound this afternoon who were targeting bluefish had great action as bent rods were evident all up and down the beach. 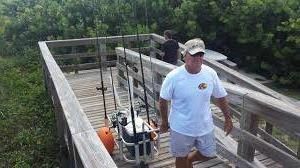 Most of the anglers catching blues were using cut mullet on a Fishfinder rig.I haven't received any reports from our local Hutchinson Island beaches, but I am sure this type of great fishing can be found at our own local beaches. The conditions look great right through Thursday with winds not exceeding 10 knots. Take advantage of these great conditions and get out and bend a rod. Pompano, whiting, croaker, bluefish, jacks, and ladyfish will all be available to target. Good luck and catch em up.